I agree, will these make it to production by Spring? There still needs to be some more minor adjustments to the figures so it is unknown when they will be ready. I second the request for a harder plastic. The plastic used in the recent French boxes is rather poor, and the pictures above seem to be the same quality. I want some. I want many some! Poor plastic? How about "nice, stiff, paintable 'poseable'" plastic that you can't even get off the sprue (using cutters) without it breaking - or so stiff they are broken in the box before you even open them? One set in particular I bought at the last brick and mortar store I knew of in Alabama - I opened the box and several rifle barrels were brittle and broken. There are other "glueable" sets - and I'm glad, because bent and broken weapons are a problem. 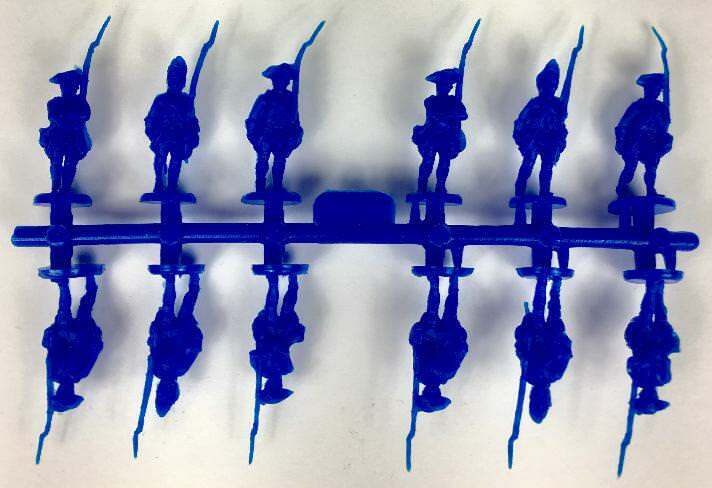 On the other hand, I have figures in plastic similar to these that are still holding up many, many years ago - like your 1808-1812 French Infantry released in 2005 that are still holding up as well as the day I bought them - a little hot/cold water treatment helped the bending a great deal. I'll deal with a bit of bend - as I said, one can fix that. Broken weapons and pieces? Well, it's like being drawn and quartered IMHO - you can find the parts and even put them back together again; but it's never quite the same. JMO. Poor plastic? How about "nice, stiff, paintable 'poseable'" plastic that you can't even get off the sprue (using cutters) without it breaking - or so stiff they are broken in the box before you even open them? I've never bought any, but BUM figures reputedly break as you, oh so gently, try to take them off the sprue. I don't think HaT uses anything like this sort of inferior plastic. I am also very much looking forward to the release of these figures. What does it mean by poor plastic? Any further explanation can help improve future releases. What kind of plastic would you like to see? How does it compare to other plastic used by HaT or other companies. Thanks! I'm not quite sure what my issue with the plastic is. It looks and feels grainy and while it is probably more an issue with the mould, the models just seem to lack detail because of it. In terms of my preferred plastics used by HaT, the plastic used in the Napoleonic Swedish sets (Infantry, Cavalry and Artillery) were all great, as were the plastic used in the Austrian Landwehr, Roman and Carthaginian box sets. The plastics that give a smooth finish. As to other companies, the very hard plastic by Zvezda is my most preferred of plastics. Soft plastics are fine overall, but I worry all the time about things bending and being a pain to get bent back into shape. No real worries with harder plastic, and on the plus side it's actually glueable with Revell plastic glue. These figures look FANTASTIC! They will look even better when they are on my tabletop! I am very grateful that my fellow HaT forum contributors have supported putting this particular set on the "fast track"... and to HaT for making it happen sooner rather than later. I did notice that some of the figures were carrying muskets, bayonets, pole arms, and flagstaffs that were bent and not in perfect alignment. Can this be corrected with the traditional remedy of a short dip in hot water; then cold water to "straighten and set" the item? Or will more drastic measures need to be taken before they are ready for service in the field? In my "mind's eye", I can already see regiments and brigades of these stout hearted fellows marching forth to defend the Empire! Not my period but these look very nice indeed. White plastic would add 25% to sales. 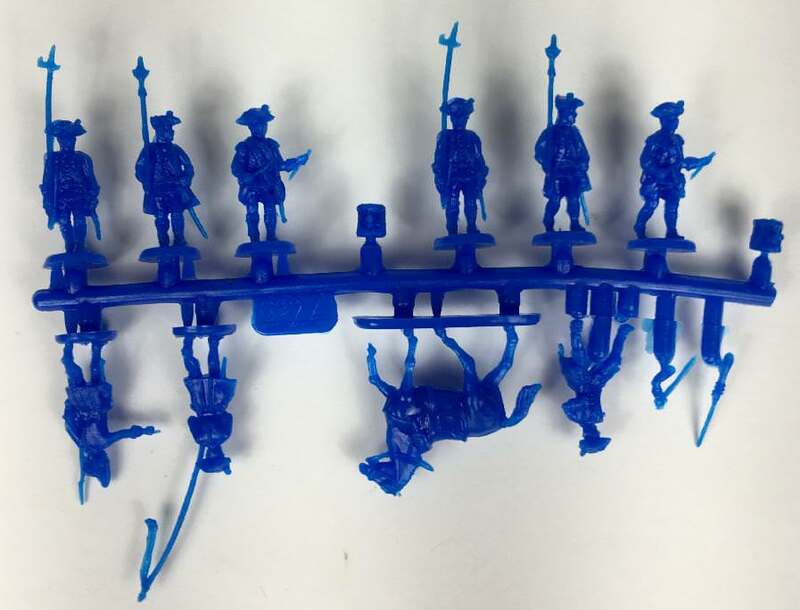 I am just glad that there are two drummers on each command sprue so that my Revell Musketeer regiments can finally have some muscians. I also approve of the 1:2 ratio of Grenadiers to Musketeers, much better than the Revell 1:1. I think also that a White Plastic would be appreciated since so many countries that followec Austrian miltary fashion also chose white as a uniform colour. Nice to see some advance on the SYW range. Figures look excellent.